GARNIER - Suede et Norvege. Danemark. GARNIER,F.A. - Suede et Norvege. Danemark. Suede et Norvege. Danemark. - GARNIER,F.A. Title : Suede et Norvege. Danemark.. Size : 18.7 x 13.1 inches. / 47.6 x 33.4 cm. Description :Very detailed map from "Atlas Spherodidal & Universel de geographie", Prepared by F.A.Garnier and edited by Jules Renouard, rue de Tournon, Paris. Uncommon map with decorative title cartouche lower right hand corner. 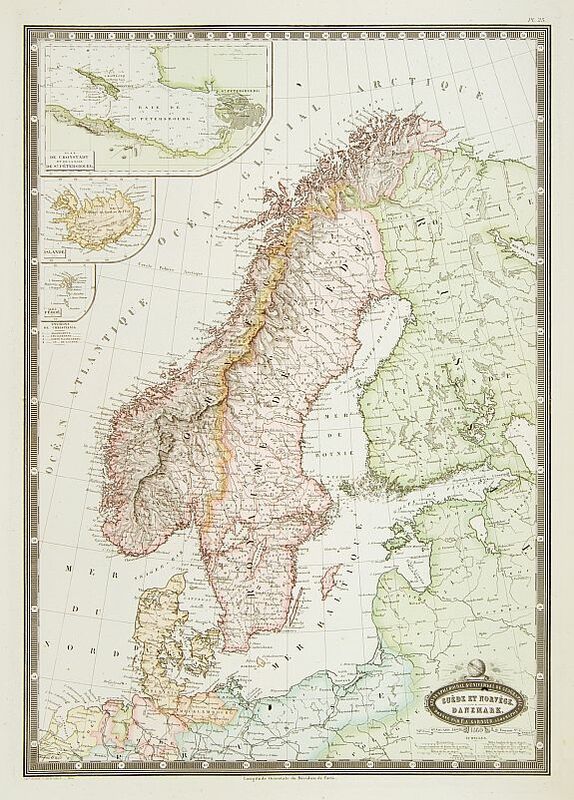 Showing good detail of Sweden, Norway, Denmark. Inset maps of Iceland, St.Petersburg and Island Feroé. Condition : Steel engraving in good condition.